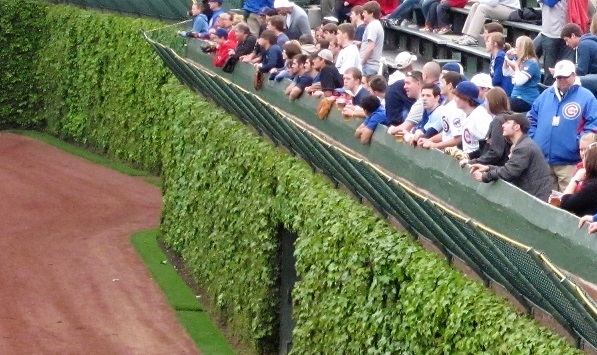 The ivy covered bleachers at Wrigley Field. Hours after ending an 108 year World Series drought the theme song of the Chicago Cubs written by local legend Steve Goodman has cracked the Top 15 on iTunes. Go Cubs Go was one of the last songs written and recorded by Goodman before he died in 1984, two weeks before he was scheduled to throw out the opening pitch of a Cubs baseball playoff game. The catchy, if simple, Go Cubs Go tune was not the first song Steve Goodman wrote for his beloved Chicago Cubs. In 1981 he wrote the darker, A Dying Cub Fan’s Last Request. Best known as the writer of the song, City of New Orleans, popularized by Arlo Guthrie among others, Goodman's Go Cubs Go has been played following every Chicago Cubs victory at Wrigley Field since 2007. Another Chicago Cubs song getting lots of attention on iTunes in these exhilarating first hours is Eddie Vedder's 2007 All the Way with the refrain, "maybe someday we'll go all the way." That day came for Cubs fans on November 2, 2016.